Those bits of paper which might otherwise be discarded and which, by and large, tell the story of the railway's design and development including, amongst other things the receipt for the first material I bought for the railway, circuit diagrams, many track plans and even my early scribblings as I was devising the (somewhat unprototypical) names for the stations. Most if not all of these are of personal interest only but for those visitors who might be intrigued to see how the model developed I have included a few items on this page. 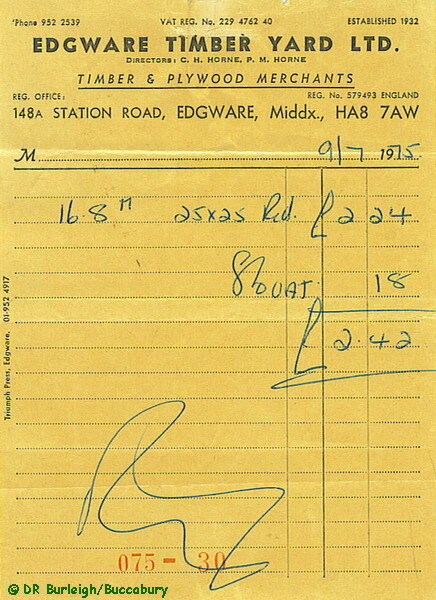 © DRB/Buccabury Let's start with the receipt for the first material I bought for the layout - wood for the frame to support Llanmynach Station. 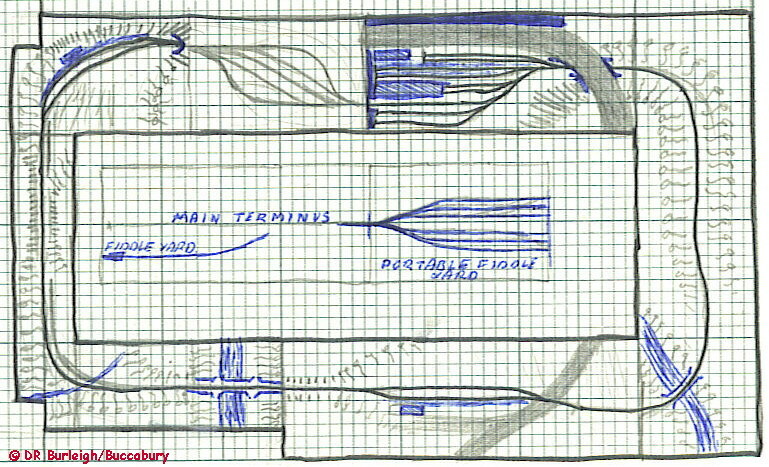 © DRB/Buccabury Before any building was done, I was bust making numerous plans for the layout; this is the earliest I can find, dated to somewhere in mid 1974 and already all the main features of the future L&TR are already there. The viaduct is in the position it now occupies in the room but although the railway runs along the window sill I hadn't yet hit on the idea of grasping the opportunity for producing a hillside. The upper station at that time was to be based on Abergynolwyn and was a simple loop. A less developed Llanmynach has but one platform and one siding but covered accommodation for locomotives and coaches and I'd no idea what to do with the coast road! Already though, I'd decided to have a 'straight run' into the loops at Rhyffedd Coed which, as yet, had no siding. 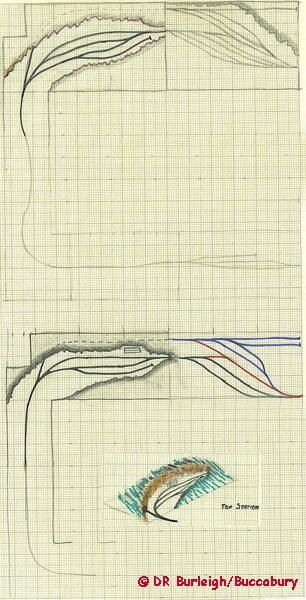 © DRB/Buccabury A variation, dated probably early 1975 shows a bit of a re-think. The tunnel was to have gone behind an existing bookcase. By this time I'd got a hillside but not where the best use could be made of the room features. Abergynolwyn had ceased to be the influence in favour of a freelance upper terminus. At Llanmynach the road had gone but the station remained unaltered. Rhyffedd Coed remained as unaltered as the available space permitted. This design had more of a light railway / general carrier atmosphere. 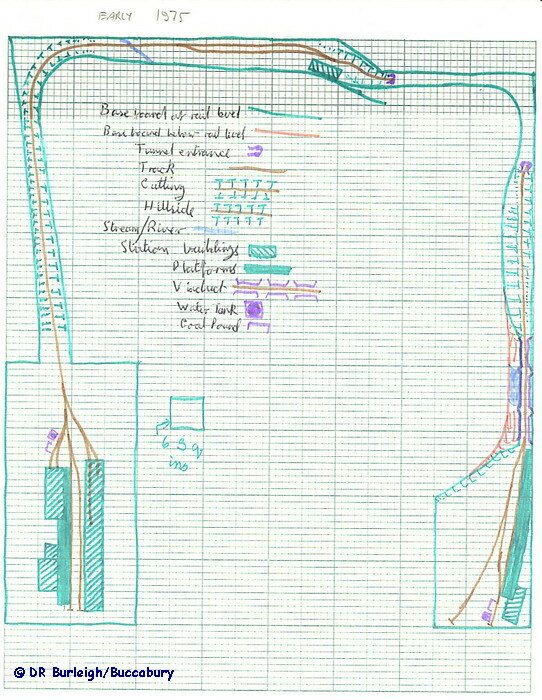 © DRB/Buccabury A more recognisable layout plan, from mid to late 1975 this is the earliest one I can find showing a complete circuit with storage loops to allow for prototypical slate traffic flow; all the bits have reverted to their earlier positions but still I hadn't clicked the hillside bit. Some people just miss the blindingly obvious! © DRB/Buccabury AT LAST! By late 1975 I'd started to appreciate the potential of that window sill to represent parts of the Festiniog, most notably the embankment at Cei Mawr and I was beginning to visualise the appearance of the whole railway. The layout of Llanmynach was now able to reflect fact as I'd started construction; the row of buildings behind the station was started but never finished. The carriage shed has switched positions with the loco shed for better access to the station and still remains but as more of a single sided shelter only. This also shows the massive warehouse which I was originally proposing to build at Llanmynach. Although I produced drawings for it, I luckily realised that it would be completely out of character. Anybody notice a striking similarity to the new museum at Towyn? Rhyffedd Coed still possesses no siding and a small halt appears between Llanmynach and Rhyffedd Coed inspired, if memory serves correctly, by Cynfal on the Talyllyn. Notice that no names had been decided. 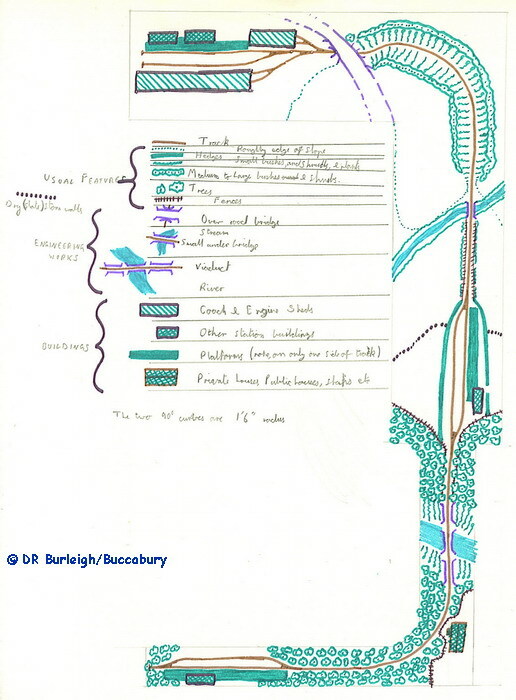 © DRB/Buccabury By mid 1976 the rest of the plan is almost there as construction had started and I'd finalised the lower part of the line. 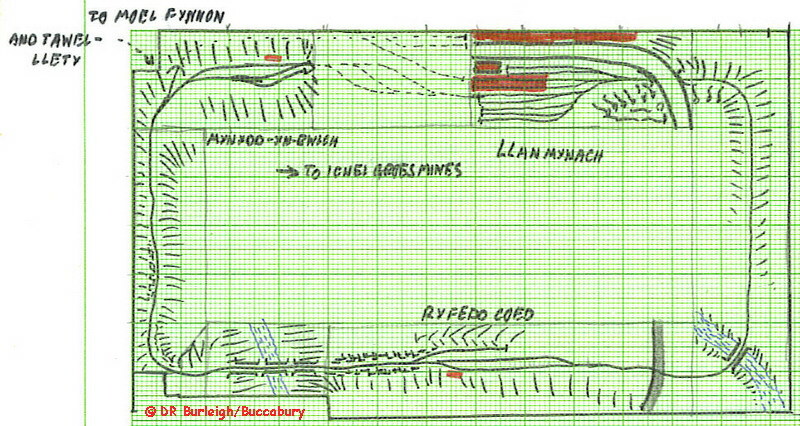 Neither Rhyffedd Coed or Mynydd-yn-Bwlch had a siding - the loops were still deemed sufficient. The Llanmynach board was built as a transportable unit with fold-up leg sections and this plan also shows the proposed fiddle yard to enable me to take it to exhibitions. © DRB/Buccabury By mid 1977 I'd realised that there was going to be room behind the top station for another track behind the cliff edge. Plans were begun to provide a second tunnel but at this stage it fed into the storage sidings and not to anywhere further up the line. At that time the storage loops were to be built as a mine cavern with both off-stage tracks feeding into it! A siding was proposed and one of the plans allowed for three loops. I wish I'd retained that - it would have been extremely useful! The sketch comes from elsewhere on the same plan and has been superimposed into a more convenient place. 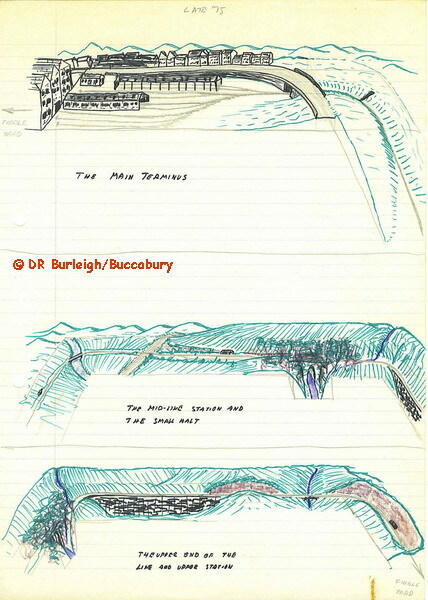 © DRB/Buccabury Late 1977 shows names appearing on the plan, although they had been developed some time before. The plan for the storage loops had not been finalised and I was considering another track at Llanmynach to feed into them. By this time Rhyffedd Coed had received its siding. 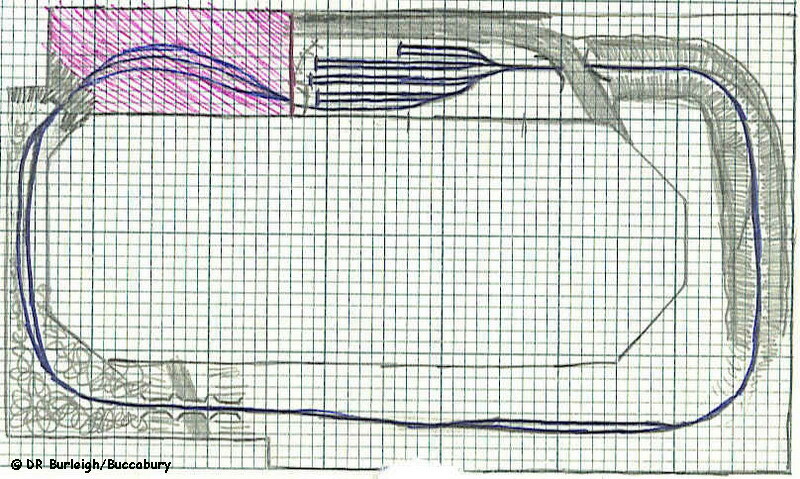 © DRB/Buccabury All later plans are similar to the 1977 one and show, to one degree or another the final version but in 1986 I produces one last plan - this one; a proposed exhibition layout based on my feeling for what I would want Tawel-Llety to look like. © DRB/Buccabury As can be seen the top covering for the fields had been applied as far as the west bank of Nant Ffernol. I used this river as a natural boundary in case of mis-matching of ground colours. 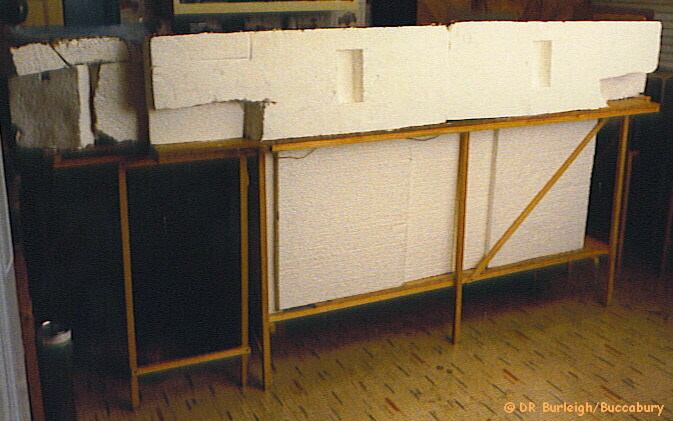 The 'open top' style of building was employed and I used six-inch wide sections of insulation board for the track base and infilled with quarter inch thick polystyrene ceiling tiles. An 'earth mix' of interior filler combined with sawdust was applied to this surface, painted brown and then given the 'flock' ground cover. The surface of the drover's road is card coated with interior filler and has a pronounced camber. © DRB/Buccabury The ceiling tiles were moulded and angled to form the hillside behind the station and the cutting to the east used solid polystyrene blocks. 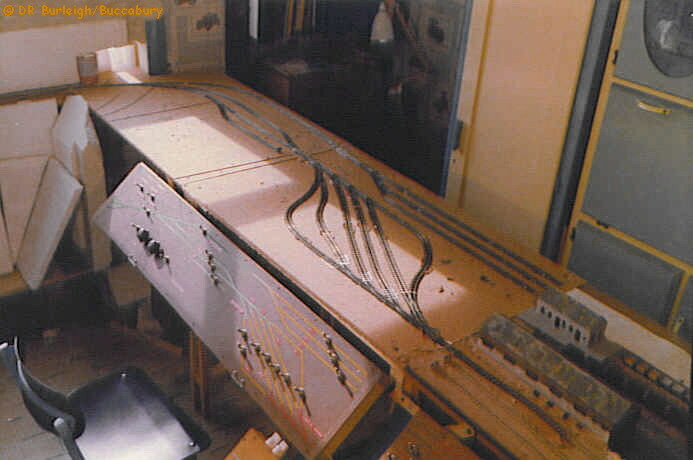 The lightweight construction of the layout is very apparent in this view. © DRB/Buccabury The technique of 'thinking downwards' was employed here - a feature which actually appears in the very earliest design of the layout. 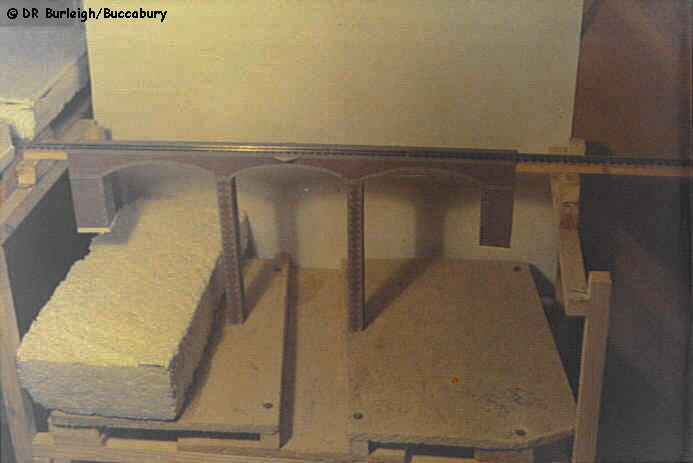 Whilst retaining the track at a constant level, the baseboard design was such that it needed only slight modification to enable the horizontal components to be fitted at a suitably lower level. The trackbed is a single piece of wood which forms part of the structure and the ravine sides are built up with solid polystyrene blocks. As this section was completely self-contained and fairly portable, detailing of the viaduct was easy. 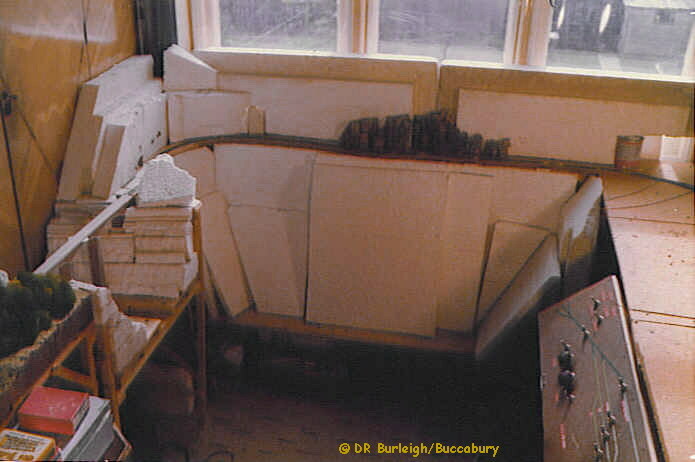 © DRB/Buccabury Now you can see how the window sill was employed to support the railway. The 'open baseboard' changed to a 'split level' type with yet another simple modification to the basic framework design and using square section timber was a great benefit here. The valley floor drops to a scale 150 feet below track level. Scenery base is again expanded polystyrene in various shapes and sizes with some cork bark to represent rock outcrops. You can also see the sides of Sychnant Ravine taking shape. © DRB/Buccabury Installation of double glazing in the mid-1980s meant that the layout had to be partially dismantled but it did enable me to take this photo showing the rear of the Cefn Glas mountainside and Mynydd-yn-Bwlch. © DRB/Buccabury By this time, although there is nothing above baseboard level the railway was a fully operating entity. Point controls had been installed at Mynydd-yn-Bwlch but the fiddle yard was still the phantom poking finger method, which was to remain until the Perspex cover was added a couple of years later. I reverted to solid baseboards here as it was more convenient but the frame structure remained the same as before. This view also shows Llanmynach loco shed and station missing details such as smoke vents, barge boards, lamps and finials. The workshops were still in the future.